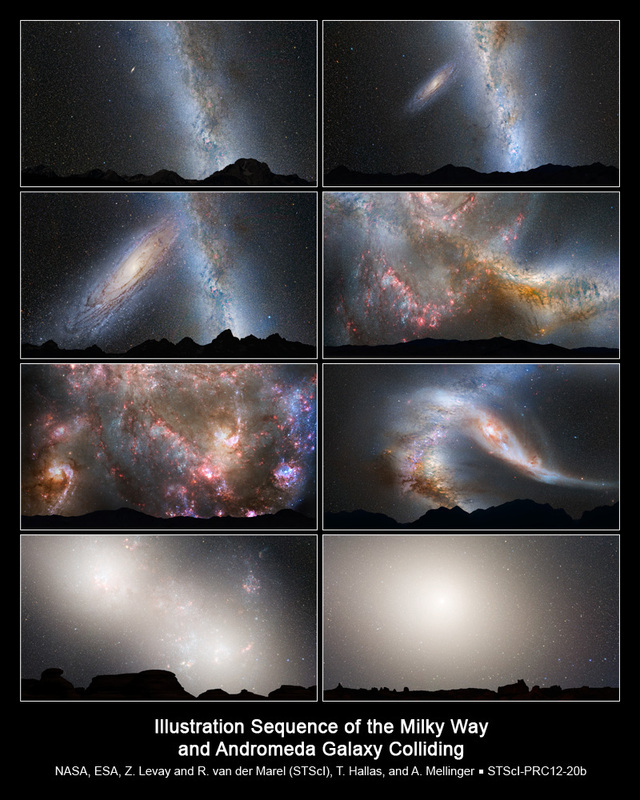 This series of photo illustrations shows the predicted merger between our Milky Way galaxy and the neighbouring Andromeda galaxy, as it will unfold over the next several billion years. The sequence is inspired by dynamical computer modelling of the inevitable future collision between the two galaxies. First Row, Left Panel: Present Day — This is a nighttime view of the current sky, with the bright belt of our Milky Way. The Andromeda galaxy lies 2.5 million light-years away and looks like a faint spindle, several times the diameter of the full Moon. First Row, Right Panel: 2 Billion Years — The disk of the approaching Andromeda galaxy is noticeably larger. Second Row, Left Panel: 3.75 Billion Years — Andromeda fills the field of view. The Milky Way begins to show distortion due to tidal pull from Andromeda. Second Row, Right Panel, and Third Row, Left Panel: 3.85-3.9 Billion Years — During the first close approach, the sky is ablaze with new star formation, which is evident in a plethora of emission nebulae and open young star clusters. Third Row, Right Panel: 4 Billion Years — After its first close pass, Andromeda is tidally stretched out. The Milky Way, too, becomes warped. Fourth Row, Left Panel: 5.1 Billion Years — During the second close passage, the cores of the Milky Way and Andromeda appear as a pair of bright lobes. Star-forming nebulae are much less prominent because the interstellar gas and dust has been significantly decreased by previous bursts of star formation. Fourth Row, Right Panel: 7 Billion Years — The merged galaxies form a huge elliptical galaxy, its bright core dominating the nighttime sky. Scoured of dust and gas, the newly merged elliptical galaxy no longer makes stars and no nebulae appear in the sky. The ageing starry population is no longer concentrated along a plane, but instead fills an ellipsoidal volume. NOTE: These illustrations depict the view from about 25,000 light-years away from the centre of the Milky Way. The future view from our solar system will most likely be markedly different, depending on how the Sun's orbit within the galaxy changes during the collision.